I think I am getting obsessed with testing online storage platforms, maybe its because I just don’t conceive that there is not one single player that is willing to provide all the things I am looking for. Some weeks ago I wrote a post about 18 features the ideal online storage service should have and Dropbox is far, far away from filling the check boxes I mention there. Since a lot of years ago I know that one of the best ways to improve IT stuff is to listen to what the customers have to say, but this doesn’t seem to apply to Dropbox, or they might have a different agenda for their service…like being sold to a bigger player? The blue box online storage service has an excellent way to gather information about what the users are suggesting and desiring for their products, its called Votebox. The way it works is very simple, people write ideas about what they want and other just vote them if they support them too (I think the guys at Uservoice copied this model and created a profitable business around it, but that’s another story). So Dropbox has a great platform to gather feedback, so whats the problem? You can see by yourself which are the most requested features since 2009 (4 years ago!!!) and still Dropbox hasn’t done anything about them. Nobody in the company bothers in providing a status update either! If nobody is going to look, and answer to the people who took the time to provide feedback about your product, why enabling the platform on the first place? Isn’t disrespectful to do this? Don’t get me wrong, Dropbox works very well, its fast, its responsive, their desktop and mobile clients are great and a lot of online storage providers use their service as a base line to launch their own products. – They don’t allow to sync any other folder rather than what its copied or moved to the main Dropbox folder. – Their pricing is still too expensive when compared to other players. USD 100 for 100 GB of Storage when other players are offering more than double for the same price doesn’t make any sense. – Their lack of encryption is something a lot of users are starting to worry about. – Their referral system where users get 500 MB for inviting others (limited up to 18 GB) looks outdated when other players like Copy offers 5 GB and without limiting the amount they can get. I live in Switzerland and people over here are very cautious about privacy, and when it comes to copy or move your files to the cloud they want to know where that cloud is and how the information is stored. This of course is not limited where I live, but people around the world is searching for services that offer native encryption (there are some third party applications that work with Dropbox and offer encryption, like BoxCryptor). Dropbox uses Amazon S3 platform which works great, but because they don’t encrypt anything on the client side, the information is potentially accessible for any Dropbox employee or if required, by the US government. We all know what happened with Megaupload and how a lot of legit users lost all their files on the service because the FBI took down the company´s servers. A lot of players are growing and growing in users because they are incorporating much more advanced specs that makes Dropbox look old and outdated, it looks almost as if its development was abandoned (at least when it comes to its core functionality). Their apps have been updated and they look great (as always), but still nothing of the user´s most requested specs are implemented or announced in anyway. But still Bono the U2 lead is investing in Dropbox right? So which is the reason Dropbox doesn’t provide feedback to its customers? Nobody knows. What are Dropbox plans in regards of this? Nobody knows. It would be great to have a statement from Dropbox answering and taking care of the users. On the meantime, while Dropbox still thinks they are alone in the storage market, you can take a look at some interesting services like Copy.com (check our review here, its Dropbox but with the things the people asked for), BitCasa (under heavy development but you can get unlimited storage for USD 10 a month, and it will be encrypted end to end!). There are several other players (SugarSync, SpiderOak, LiveDrive, among others). I will try to make a “complete” list on the following weeks. What do you think about Dropbox´s position? Feel free to leave your comment below. The subject is misleading, it sounded like Dropbox was the first cloud storage / sync service provider. It was not! 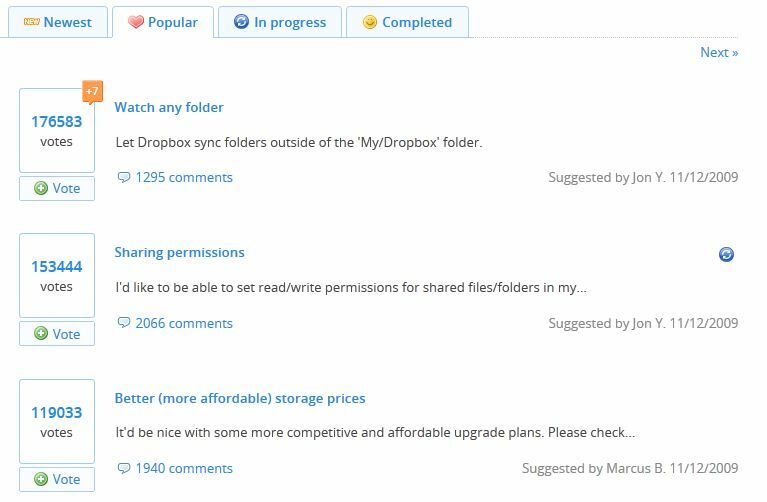 Dropbox only made folder sync service popular by targeting consumers through creative marketing. But Dropbox sync is for consumers only. It can only sync a special folder (the Dropbox folder). For business service, you need enterprise folder sync feature as offered by DriveHQ.com, which supports: Sync any local folder with any cloud folder; sync multiple local folders with multiple cloud folders; real-time sync and scheduled sync; one-way and two way sync; multiple sync tasks with different schedules. I moved from Dropbox to Copy, it’s the best, it gives you 15GB of online storage for free, and 20GB if you use a referral link. It’s very fast, secure (AES 256), and supports versioning and Wifi sync, and there’s a client for every platform (Mac, Linux, Windows, iOS and Android). Much better than Dropbox. Other options out there indeed… http://www.connecteddata.com. Secure, Off-cloud and ZERO recurring fees!